A quiet day at sea after the drama of yesterday. 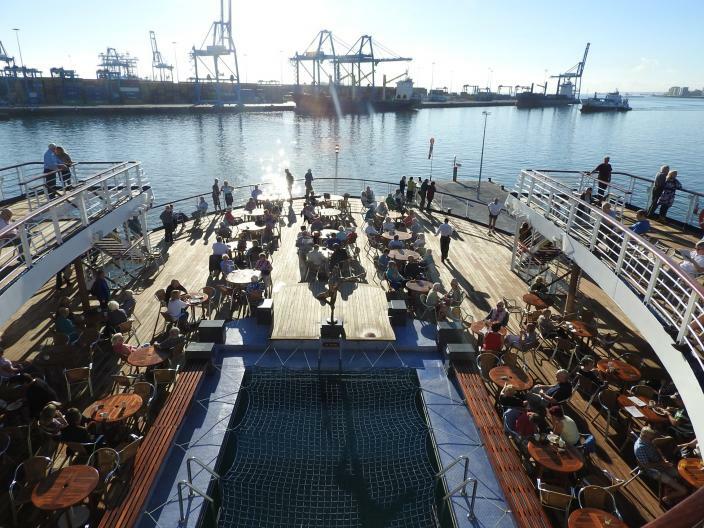 The decks were full of people enjoying the sunshine, but we managed to find a spot to sit and read in between eating, sneezing, blowing my nose and napping. When I was in today's Photography Lecture (Photographing Architecture) Martin was lucky enough to hear the shout of 'dolphins' and saw a pod of dolphins riding the bow wave of the ship. There are a few passengers who stand for a lot of the day looking out for dolphins, whales and birds from the deck at the front of the ship. In general there are less people there as the decks with all the seating are at the rear of the ship where the Bistro (and the all day tea/coffee point) is. There are also those passengers who always find something to complain about - like the lady who complained that the dolphins were brown and not very big! Later in the day we were again on the front deck reading and the shout of 'blow' (whale spouting) went up. The dozen or so people on the deck all got up to look and we saw another whale spout a few seconds later, but quite far away. We didn't see anything more and eventually went back to reading. That evening we watched the Show Team perform a Tribute of Queen Songs which was very good. Then we watched two passengers take part in a 'Catchphrase' game on stage in one of the bars...very cringeworthy, but entertaining enough when you have nothing else to do. More eating today, in between reading, napping and the 11am talk on Cape Verde and the 15.30 'Photographing Nature' Lecture. The food in the Bistro is excellent - for lunch and dinner as well as cold meat, cheeses and salad there is always soup, a fish dish, a pasta dish, two different meat dishes and a vegetarian dish, with various accompaniments of rice, potatoes and veg, and another meal choice on the live cooking bar. Plus 4 different sweets and a fruit bowl. There are also several different mini cakes, biscuits and sandwiches at afternoon tea. We still haven't been to the Restaurant for either breakfast or lunch, but that's mainly because the Bistro is informal and you can sit where you want, whereas in the Restaurant you are seated with others at the next available Table ... and have to talk to them! In the evening we didn't fancy listening to the Marco Polo Orchestra so watched Sense and Sensibility in the cabin, which neither of us had read or watched before. Hugh Laurie's character was so funny!